This Dyson head-to-head comparison is going to be looking at the Dyson V8 vs. V11. The V11 is the newest Dyson model to hit the market, while the V8 continues to be one the best Dyson vacuums for the value shopper. Are the upgraded features of the V11 worth the added cost? Or are you better off saving some cash and opting for the tried-and-true V8 model? Find out in today’s Dyson cordless stick vacuum comparison. Want to get right to the good stuff? Click here to jump right to the key differences and summaries! What is the Dyson V8 & V11? 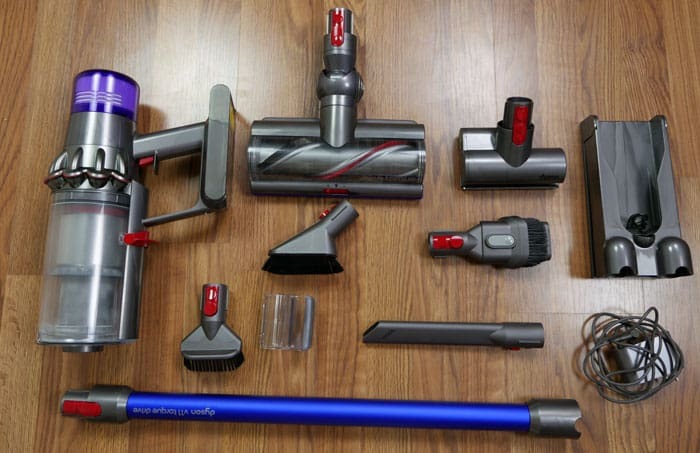 The Dyson V8 and Dyson V11 are cordless stick vacuums and part of Dyson’s V-Series lineup. 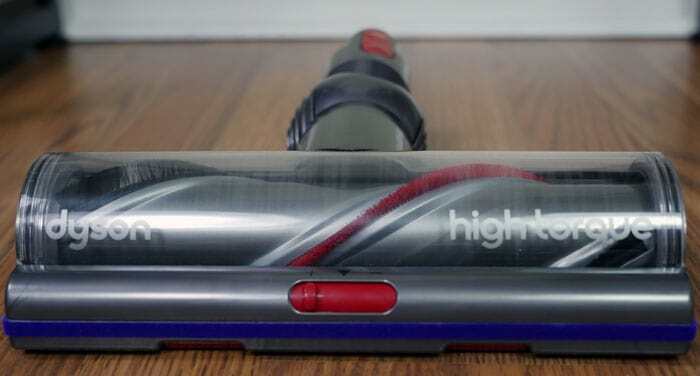 Both vacuums use a multi-surface brushroll that’s powered by a digital motor. The motor is designed to fit into the handheld portion of the vacuum, allowing it to operate as a handheld or cordless stick vacuum. The Dyson V8 was released in 2016 and the Dyson V11 was released in March 2019. There are a couple different versions between these two models. The Dyson V8 is available in Absolute and Animal versions. The Dyson V11 is available in Torque Drive and Animal versions. First up, let’s talk about the main differences between these two models. Both the V8 and V11 models are 2-in-1 vacuums, that function as powerful stick vacuums or portable handhelds. The difference is how the parts look when assembled. The V8 design has the extension wand intersecting with the handheld motor and dust bin at a perpendicular angle (like a “T”). The V11, by comparison, rotates the dust bin canister 90 degrees for more of an in-line assembly. According to Dsyon, the design decision to bring the wand, dust bin, and body inline on the V10 and Dyson V11 was done to improve performance. 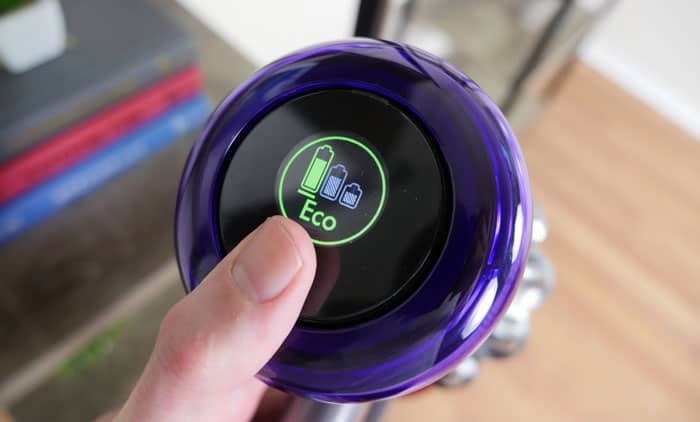 The Dyson V11 also comes with an advanced digital screen located behind the motor that displays features like cleaning mode, estimated remaining run time, and performance and maintenance videos (videos with the V11 Torque Drive model only). The V8 model does not include any digital screen or video notifications. The Dyson V8 has a maximum suction power of 115 AW, while the Dyson V11 maxes out at 185 AW. In addition to raw power, the Dyson V11 also has intelligent suction. This allows it to automatically adjust suction based on the floor type and level of debris. Using the power where you really need it may mean saved battery power and less time on the charger. The dust bin of the V8 is also slightly smaller than the capacity of the V11. The V8 can hold up to 0.54 L of debris while the V11 can hold up to 0.74 L of debris. The digital motor in the Dyson V8 can spin at up to 108,000 rpm, while the Dyson V11 can spin at up to 125,000 rpm (the same speed as the V10 motor). The faster spin speed is another way that the V11 can generate greater suction than the V8. 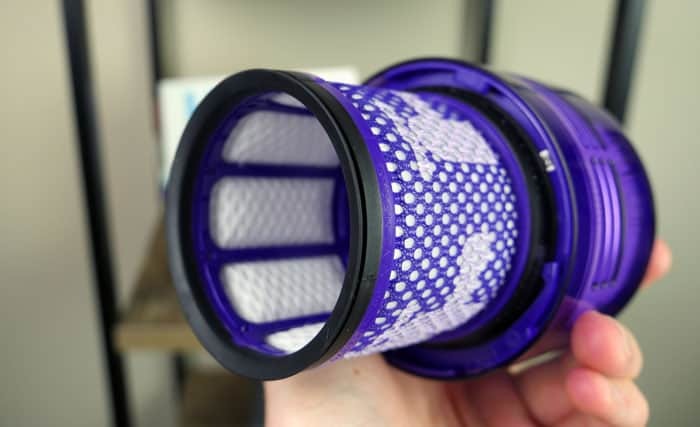 The Dyson V8 comes with the Direct Drive cleaning head (included with the Absolute or Animal versions) or the Fluffy cleaning head (included with the Absolute only). The Dyson V11 comes with the Torque Drive cleaning head. This head is similar to the Direct Drive cleaning head, but has 20% more suction power. The V11 does not include the Fluffy cleaning head, which can be a handy tool for primarily cleaning hardwoods or suctioning large debris from hard surfaces. There are also some differences in included accessories, but this detail feels less significant compared to the other points. The exact differences varies slightly based on exactly which version of each model you choose. See below for a full list of accessories that come with each model. How Does the V8 & V11 Clean? Both models are powered by the “trigger” switch, which allows you to hold down the trigger when you want cleaning power, and it turns off when you don’t hold it down to avoid any wasted battery life. Both the V8 and V11 also rely on cyclonic suction to generate their power. These cyclones are built directly in front of the motor and add a classic Dyson aesthetic to the look of these vacuums, as well as being functional. As mentioned above, cleaning heads is another area where these two models differ. For everyday cleaning, the Dyson V8 comes with the Direct Drive cleaning head while the Dyson V11 comes with the upgraded Torque Drive cleaning head. Both of these cleaning heads use a spiral brushroll to help agitate carpets and lift debris into the vacuum. The Torque Drive cleaning head is the newer model and offers 25% better performance over the Direct Drive head (according to Dyson). The V8 Absolute also offers the Fluffy cleaning head. This head is a soft roller style head that is perfect for gentle cleaning hardwood floors or for capturing large debris. The Fluffy cleaning head is not available on the Dyson V11, but can be found with the Dyson V10 Absolute or Dyson V8 Absolute. Both the V8 and V11 can operate as a stick vacuum or handheld vacuum. Each of these points uses the same type of quick connection, a bright red button to attach or detach parts as needed. Since all tools have the same connection it’s quick and easy to have exactly what you need for each cleaning job. How big is the V8 and V11? Considering size, the difference isn’t really all that critical between the two models. The V11 is slightly heavier, wider, and a hair deeper than the V8 but I wouldn’t consider any of these differences to be real “difference makers”. What accessories come with the V8 & V11? The included accessories also varies a bit between each mode and between each version of each model. Similarly the Dyson V8 Animal comes with all of the same parts and accessories listed above except for no mini dusting brush and no Fluffy cleaning head. The Dyson V11 Animal includes all of the same parts and accessories listed above except for no mini dusting brush. Run time ~40 mins. ~60 mins. RELATED: Need to clean your car? Click here to learn more about the Best Car Vacuum. For more detailed cleaning tests and performance notes please see our full Dyson V8 review and full Dyson V11 review. When cleaning hardwoods, the Dyson V11 definitely had an advantage, scoring 99% against the Dyson V8 score of 89%. While their performance against kitty litter, rice, and sugar is pretty much the same, the results against cereal showed the V8 significantly struggling. The V8 was only able to capture 58% and the V11 captured 100% of cereal dropped during this test. 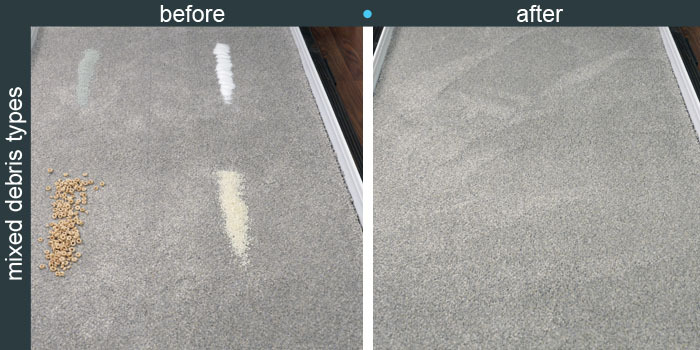 For carpet cleaning on low pile carpet, the results between these two models were similar, both scoring between 97-100% on all debris types. Although the V8 and the V11 do use two different cleaning heads, I didn’t notice any drastic difference in performance between these two. 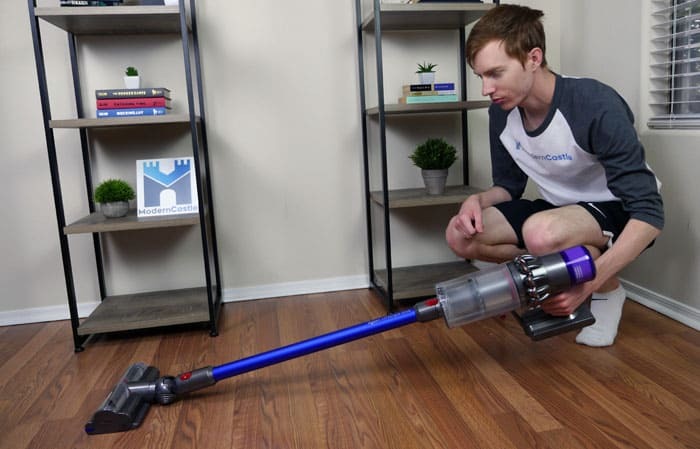 RELATED – What’s the best vacuum in 2019? 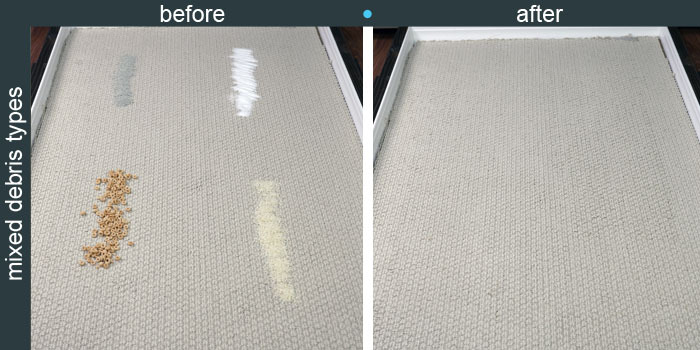 Similar to low pile carpet, the high pile carpet results were similar to low carpet. The performance of cleaning up the rice was slightly decreased on the V8, but it was still able to capture 93%. The V11 was 100% on all debris types, except for cereal where it scored 99%. Overall, a really great performance. How easy is it to use the Dyson V8 & V11? Regarding usability, many aspects are the same, but there are also a few notable differences. We’ll do a quick run down of usability below. Out of the box, both the V8 and V11 come basically assembled. It’s just a matter of “quick connecting” the desired parts to make the style of vacuum you need, stick vs. handheld. Both models include a wall dock that allows you to hang up your vacuum when not in use, as well as the ability to store two tools. If you have power located on the wall, you can thread the charger through the dock, allowing you to charge and store your vacuum at the same time. As far as daily use goes, there are many similarities between the models as well as a few key differences. Both the V8 and the V11 use the “trigger” control to turn the vacuum on and off. This helps to prevent any unnecessary battery usage when you’re not cleaning. The V8 has a small light that shows you remaining battery life, but it’s pretty discreet. On the other hand, the V11 has a large digital screen on the back of the motor that is more prominent and provides a number of different details. On the V11 screen, you can see remaining battery life (as icons on the V11 Animal or as a numerical run time countdown on the V11 Torque Drive). You can also select a cleaning mode, Eco, Auto, or Boost. For reference, the stronger the cleaning mode, the stronger the suction, and the faster your battery may drain. Emptying the dust bin is another area where these two models differ. 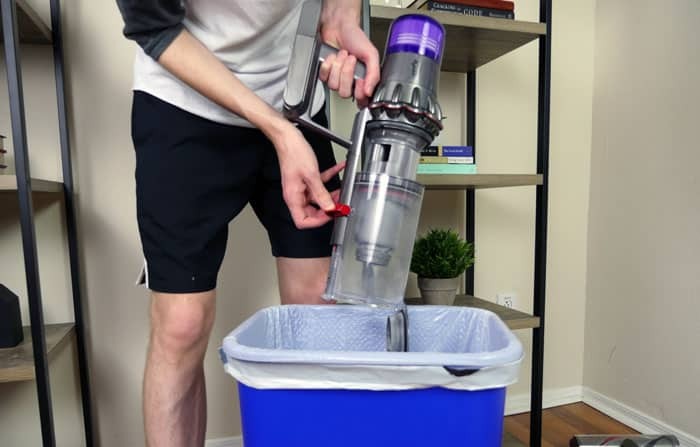 V8 Emptying: To empty the dust bin on the Dyson V8, there is a pull level behind the cyclones that allows the cyclones and filter to rise up and the debris to fall out into a trash can below. V11 Emptying: To empty the dust bin on the Dyson V11, it’s more of a “point and shoot” technique. Instead of a pull lever on top of the vacuum, there is instead a lever down the side of the dust bin that you slide. When you do, the dust bin canister shoots forward, opening the dust bin canister lid and forcing the debris out. The maneuverability of the Dyson V8 vs. V11 is another area where the two models are quite similar. Both models are basically the same size and have similar style cleaning tools and attachments. The biggest difference is the position of the dust bin, since the Dyson V8 has the dust bin located in the “T” orientation with the extension wand, while the Dyson V11 uses an in-line configuration. That being said, both models have a great recline and can easily fit under most furniture and swivel around obstacles or to make tight turns. I would say that the in-line configuration does make the V11 feel slightly heavier when used as a handheld just because the center of gravity is further from your wrist, making the handheld slightly longer than the V8 overall. What are the Dyson V8 & V11 maintenance costs? The maintenance costs for the Dyson V8 vs. V11 is another point where there are some differences. In the 3 year span between the release of the Dyson V8 and the V11, there have been pretty significant jumps in battery power. Although the run time on the V11 is only 20 minutes longer than the 40 minute run time offered on the V8, the battery is claimed by Dyson to last up to 5 times longer. The battery for the Dyson V8 should last around 3-5 years, but the battery for the Dyson V11 is said to last up to 15 years (according to Dyson). V8 Costs: Annual maintenance costs on the V8 really depend on how long the battery lasts. A new battery for the Dyson V8 is around $50. So if it lasts 5 years, that’s an average annual maintenance cost of $10. V11 Costs: The long life span of the battery makes annual maintenance costs essentially $0 / year on the Dyson V11. Both the V8 and the V11 comes with lifetime washable HEPA filters. This is a nice addition, as it protects the user from costly or frequent filter replacements. PRO TIP: To keep these filters operating at their best, wash once per month with cold water and allow to air dry for 24 hours. The Dyson V8 can run for up to 40 minutes, while the Dyson V11 can run for up to 60 minutes. Intelligent suction control: The Dyson V11 has the ability to automatically adjust suction based on whatever floor type it is on. This prevents the vacuum from using too much suction power on areas where it’s not needed, and saving the power for the deep cleaning. Of course, you always have the option to manually adjust the cleaning mode to your desired level of suction (Eco, Auto, or Boost). Remaining battery display: The V11 also includes the digital display behind the motor which helps to keep track of your remaining battery life. The V11 Torque Drive will show a numerical run time countdown and the V11 Animal will show a receding battery icon. 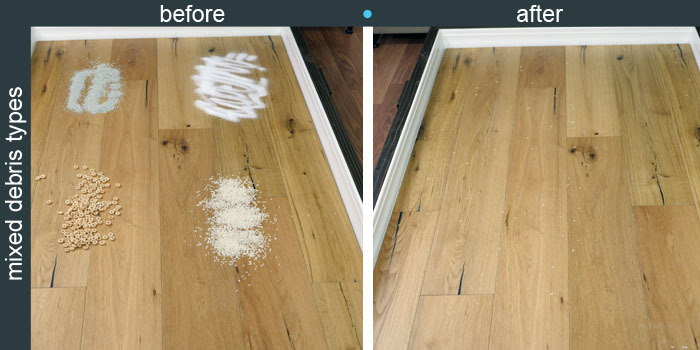 The current cleaning mode will also adjust the amount of remaining cleaning time available. Is the V8 or V11 quieter? 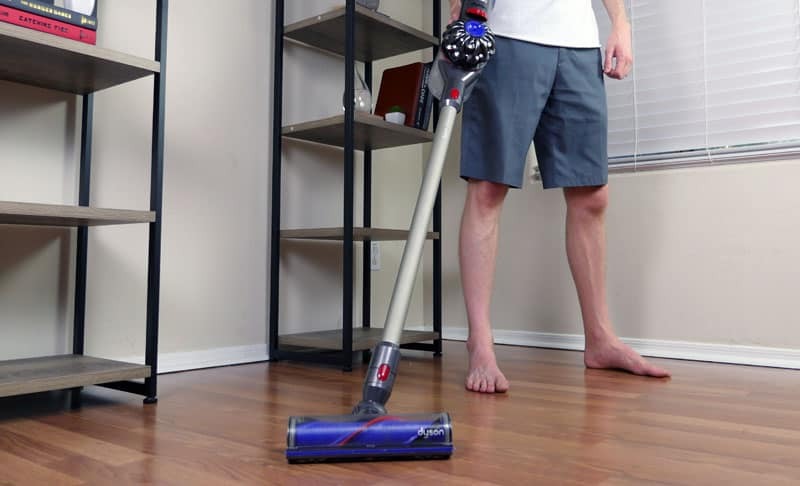 Concerning noise, the Dyson V11 is quieter to operate than the Dyson V8, but these results may vary based on the exact cleaning mode or flooring type that you’re dealing with. 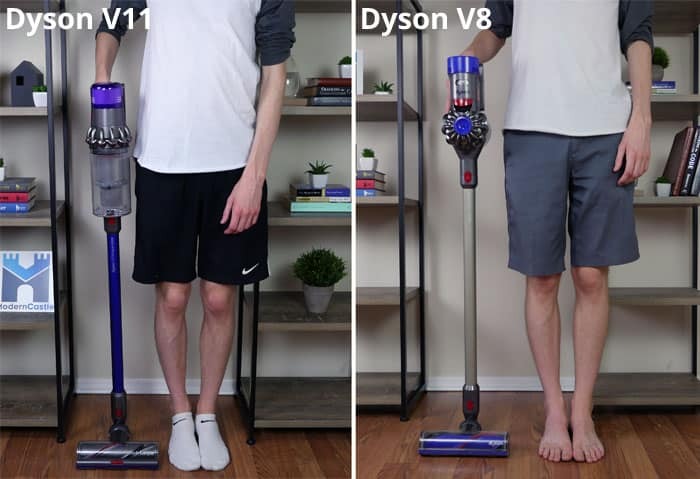 Below, you can see a full comparison of how the V11 and V8 fared compared to all current Dyson V-Series models. To get our results, we measured the noise output from 3′ away while each vacuum was running on the selected cleaning mode. 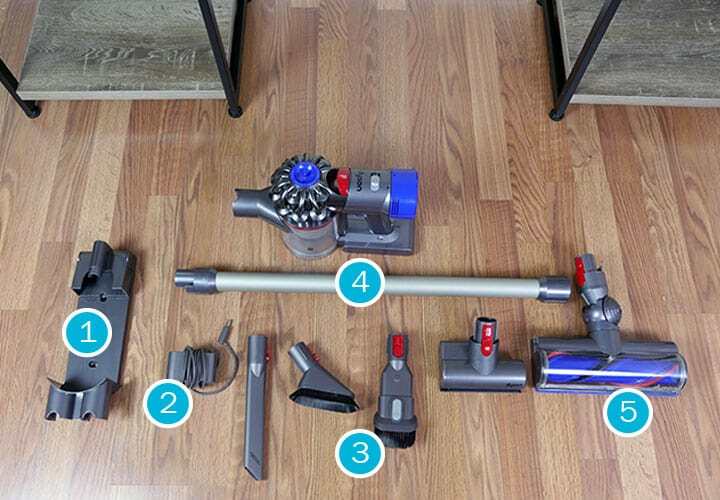 The Dyson V8 vs. V11 share the same general design, but have many different features and aspects that could make one or the other a better value, depending on what exactly you’re looking for. The Dyson V8 is a lower price which would conceivably make it the better value for many users. It has a great cleaning performance (average of 95%), a 40-minute run time, and includes the Direct Drive and Fluffy cleaning head (Absolute model). By comparison, the Dyson V11 is more expensive, but also brings a number of new features. It has better cleaning performance (average of 99%), a 60-minute run time (20 minutes longer than the V8 model), and includes the Torque Drive cleaning head which is stated by Dyson to clean up to 25% better than the Drive Drive cleaning head. The V11 also has intelligent suction technology, a larger dust bin, and the digital screen which lets you change cleaning modes, access remaining run time, and view maintenance and performance videos. Weight 5.75 lbs. 6.68 lbs. The Dyson V8 is a great mid-range Dyson cordless stick vacuum. It has many advanced features over the more basic models, like the Dyson V6, but is also less costly than the most advanced Dyson V11 model. 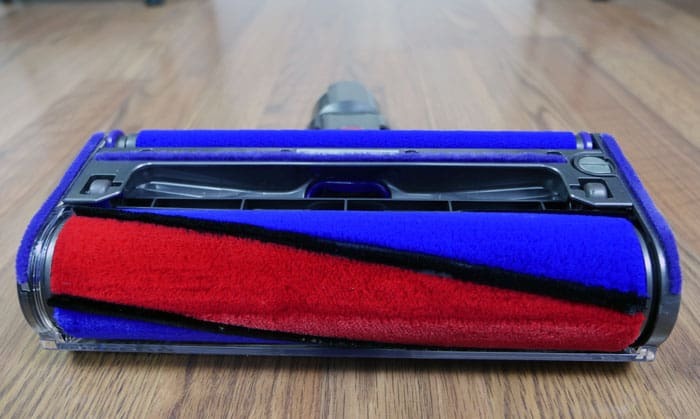 Want the Fluffy cleaning head – If you primarily vacuum hardwoods or if you frequently find yourself cleaning large debris spills, the Fluffy cleaning head can be a nice addition. This head is only available on the Dyson V8 Absolute and is not available on any of the Dyson V11 models. Want great cleaning performance – On average, the Dyson V8 model still scored 95% overall. Despite the slightly less powerful suction, I was still very impressed with the cleaning performance of the V8. Want a lower price – If you’re driven strictly by dollar signs, you’ll be happy to know that the cost of the Dyson V8 is about half that of the Dyson V11. 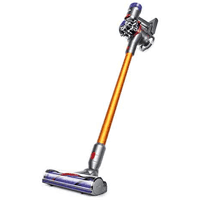 For more information or to buy, check out the Dyson V8 here. The Dyson V11 is the newest model in the Dyson lineup and offers the most advanced features of all cordless stick vacuums in the V-Series. If you’re looking for the latest Dyson technology, the longest run time, and exceptional cleaning performance, the Dyson V11 may be the right option for you. Want a digital display screen: The V11 is the only current Dyson model that offers the digital display screen. This is a bleeding edge feature, allowing you to quickly change cleaning modes and see estimated remaining run time. Want stronger suction: Compared to the V8, the V11 offers stronger suction, maxing out at 185 AW. (The V8 maxes out at 115 AW.) 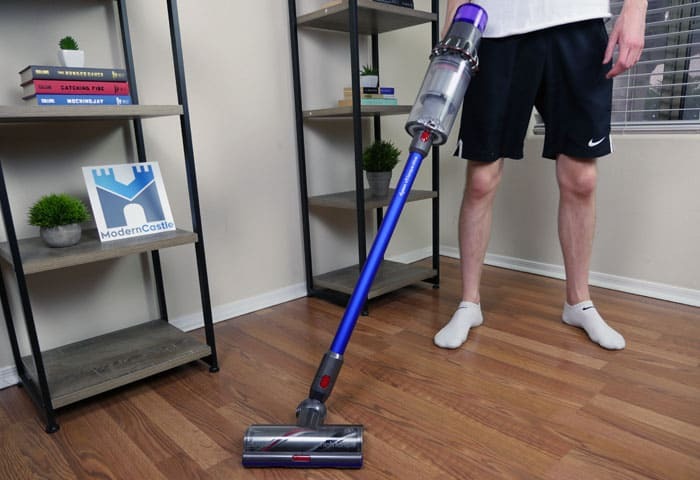 This is the highest level of suction in any cordless stick vacuum we’ve reviewed to date (or that we’re even aware of), putting the suction on par with many full size upright vacuums. Want intelligent suction: The intelligent suction is a nice addition to the V11, allowing the run time to stretch even further and also allows the vacuum to run quieter when additional power and suction is not needed.